What changes do you think the inquiry will prompt? Just a way to spend money. Nothing will come of it. just a way for bligh to give some friends a job for 12 months. Theres are alot more then ten people still missing, it will be years before all are found. farmers will find them in a few years when working their land. Why wasnt the dam gates open at christmas to release water. Why was it a 120% at this time, it should have been opened to let water out so it could hold more. Also its not global warming. These same floods and heavy rain happened back in 1974, 1911, 1983 in centrtal queensland and southeast QLD. look up your history. its just the cycle of the planet. Interesting to see if anyone will take any responsibility for development in flood plains... starting to look like planning failures. Will we ever hear the full story from real estate touts? "Charming property, river outlook, but you'll probably be flooded out in 10 or 20 years"
Video Locals in Warracknabeal are preparing for the worst flood in the Victorian town's history. 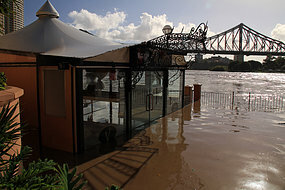 Video Wild storms have lashed south-east Queensland, causing more damage for locals trying to rebuild after the floods. Video Former prime minister Kevin Rudd has put on a BBQ for flood-affected residents in the Brisbane suburb of West End. Video Lleyton Hewitt has bowed out of the Australian Open, falling 9-7 in the fifth set to Argentinean David Nalbandian. The ABC News Online Investigative Unit encourages whistleblowers, and others with access to information they believe should be revealed for the public good, to contact us. Game on: the stars of tennis come out to play at the Australian Open in Melbourne. A teenage girl caught in the raging torrent of water that swept through Toowoomba has been found safe and well. Thousands of country music fans have flocked to Tamworth for the annual music festival. Part II: Photos taken over Brisbane last week have revealed the scale of devastation across dozens of suburbs. Tucson shooting: a political game changer?